On the centenary of the end of the First World War, the Danny Boyle inspired memoriam saw over 30 UK beaches transformed into a nationwide gallery in memory of the fallen. 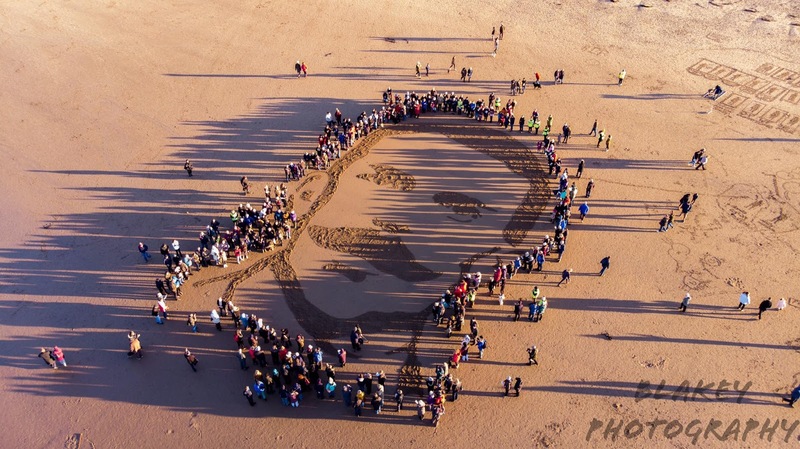 Hundreds of people flocked to Redcar beach this Sunday to 'make art, not war' - as part of the national remembrance day event Pages of the Sea. The event, which coincided with the hundred-year anniversary of the end of the First World War, saw the image of Private Theophilus Jones of the Durham Light Infantry etched onto the sands earlier that morning. Born in Darlington, Private Jones was, according to online records, a headmaster at Thringstone School in Leicestershire and is said to have once lived on Ash Grove Avenue, in West Hartlepool. He is believed to be the first British solider killed in action on home soil, on the 6th December 1914, whilst defending Hartlepool from a German coastal assault. He was aged just 29. 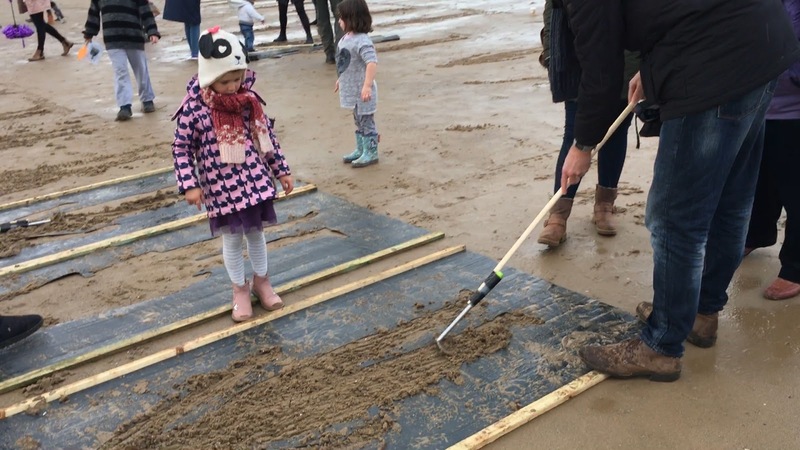 As families and the local community came together to make their own outlines of soldiers alongside Private Jones, retired teacher Peter Ellwood and his wife Ellen had come to Redcar to make their own tribute to his great Uncle, Joseph Addison Kirkup. Speaking with great pride, Peter revealed that Joseph was "killed by a shell whilst trying to fix a telecommunications line" during the German Spring Offensive and The Battle of the Lys in Flanders, North-East France on the 9th April 1918, at the age of 21. "It's an opportunity not to be missed really, 100 years, Armistice. "It's quite an important milestone for us to remember him, and to remember everyone that was killed in the First World War." The event which saw the beaches of Sunderland and Redcar join over 30 coastal counterparts, from St Ninian's, Shetland to Porthcurno, Cornwall, was organised by 14-18 Now - as part of its five-year programme of 'connecting people with the First World War' through art. Speaking at the event, Artistic Adviser for 14-18 now, Ruth Mackenzie CBE was proud to champion film maker Danny Boyles "great idea" to mark the landmark anniversary. "(Danny) said lets remember all the soldiers who died... on this day, the last day of the first world war, a hundred years ago; and lets do portraits in the sand and then watch the sea take away the portrait." But of course the memory will still be with us in our hearts and in our minds." As the autumn sun peaked through that afternoons clouds, at a little after 3 o'clock a crowd had gathered around the image of Private Jones, to hear the poem 'The Wound in Time' - penned especially for the occasion by British Poet Laureate Dame Carol Ann Duffy - read aloud by a small group of volunteers. Poetry gargling its own blood. the town squares silent, awaiting their cenotaphs. Shortly after, as the cold night-sky drew in, the waves of the North-Sea washed-in, taking with them the images of Private Jones and the many others made around him - but not before the memories of a great many men and women who served were imprinted on all that experienced this very special event. The Royal British Legion was founded by veterans after the First World War. A century on from the start of that conflict, they are still helping today's Service men and women, veterans, and their families in almost every aspect of daily life. They also champion Remembrance, safeguarding the memory of those who have given their lives for our freedom through Remembrance education and events. Pages of the Sea proved very thought provoking. I like that photo of the people gathered around the face etched in the sand. Thanks Stuart - that is a great photo, but I must declare that it's not mine. A gentleman called David Newton of Blakeyphotography took it with his drone and kindly allowed me to use it for this piece.